It has been pointed out by several experts that our Holy Father pulled a neat dodge by making the Tridentine Rite an extraordinary form of the Roman Rite rather than a separate rite. Had he made it a separate rite, it would have been necessary for priests of the Latin Church to be given special permission to celebrate it; just as they need special permission to celebrate, say, the Syro Malankara Rite. By making it clear that there are two forms of the Roman Rite, he cut through all the red tape which would have impeded clergy from using it. But there is a third form of the Roman Rite: the Anglican use of the Roman Rite, used in the US by former Anglican parishes. This was set up with massive encouragement by ... no less a figure than Joseph Cardinal Ratzinger. It uses The Book of Divine Worship, which is in effect the Anglican Book of Common Prayer with Dr Cranmer's heterodox Eucharistic prayers replaced by, for example, a 'Tudor English' translation of the Roman Canon familiar from its use in Anglo-Catholic Altar missals of the pre-Concilar period (incidentally, it is not Coverdale's translation). This form of the Roman Rite, of course, overlaps intriguingly with the Tridentine Rite. 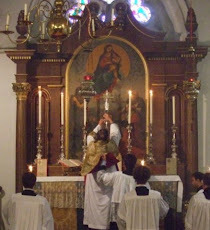 Most of its Mass Popers, being taken from the medieval English Sarum Rite, have the same Collects, Epistles, and Gospels as the Tridentine Rite - although in the period post Trinitatem there is some dislocation, inherited from Sarum. Earlier generations of Catholic Anglicans supplemented the Prayer Book by adding Introits, Secrets, etc., from the Roman Missal and the'English Missal, still in print, represents the final flowering of this tradition and offers a splendid means of saying the Tridentine Masss in superb English. So, if my Devon friend Fr Peter Morgan, ordained in the SSPX and latterly offering a dual ministry, one to an Anglican Papalist congregation and the other to a Tridentinist group, invited me to preach at the latter celebration, a sermon written for my BCP congregation at Broadwood Widger 20 miles to the north, would fit. In this blog, I can kill two birds with one stone by commenting on the Tridentine propers: bird 1 being adherents of SSPX or FSSP; bird 2 being the Prayer Book Society. I used to explain to the probably bemused folks of Broadwood Widger that their closest allies were SSPX, and that Benedict XVI was the first pope ever to be a Prayer Book enthusiast. I very much hope that both of the minority forms of of the Roman Rite will have a great future. As far as the Book of Divine Worship is concerned, it has one problem in its present form. It assumes as its base an American version of the Prayer Book. For the Anglican Use of the Roman Rite to spread, I would suggest the following methodology: a decree providing (1) that certain specified versions of the Prayer Book (and Common Worship and English Missal) authorised in particular Anglican provinces were hereby authorised but (2) with their Euchristic prayers replaced by the formulae herein provided and (3) with certain supplementary provisions (e.g. for December 8; August 15, etc. etc.). Such a provision would not only be useful for Anglican groups entering into full communion with the Holy See, but would undoubtedly influence the worship of those whose unity with Rome was still impaired. Labels: Extraordinary form; Book of Common Prayer; Book of Divine Worship. The Oxford Newman Society's colloquium on blogging was great fun; indeed, what a splendid body that society is. How fortunate the Catholic Chaplaincy is to have such a strong, intelligent group with praiseworthy views on everything; one of two bright beacons (the Pusey House congregation is of course the other) in the University (or am I being unfair to leave out the Oratory and Blackfriars?). And how fortunate Oxford is to be so rich in Catholic blogs. I learn a lot from that highly literate and engaging blog, massinformation, run by three Catholic Anglican seminarians. And, of course, there is the New Liturgical Movement to keep us updated on everything truly progressive in liturgical matters; and that's not all. Those with an interest in Dominican liturgy and/or the Anglican Book of Common Prayer can this week hear the great chant Media Vita , sung during Lenten Compline in the Dominican and Sarum (medieval English) rites and incorporated by Dr Cranmer into the Anglican funeral service (it is to be sung by the clerks, or else said, while the body is made ready to be laid into the earth). It can be heard on another great blog, Godzdogz. I wonder if anybody has ever thought of using this Dominican version and melody at Anglican funerals? It would make a lovely change from that nonsense from Scott-Holland about how Death is Nothing, which so many of the bereaved have heard at other funerals that the officiating priest is repeatedly persuaded into allowing it again ... thereby compounding the problem. It was good to hear Fr Zed; knowledgeable about the Inside liturgical history of the last couple of decades and with his fingers on many pulses internationally. He left us with a strong sense of the grip Pope Benedict has on the cultural life of the Church: in the last year we really have turned a corner. As an Anglican, I found myself thinking: in the late 1960s and thereafter, as the RC Church lurched in the wrong direction in so many areas but especially the liturgical, Anglicans, and not least Catholic Anglicans, deemed it the proper thing slavishly to adopt each newly minted absurdity. Now that things are getting back on the rails in Rome, will the Anglican faith-community follow healthy leadership as readily as then it did the unhealthy? Many of our younger Catholic Anglican clergy are already doing so; but what about the dominant gerontocracy? A jolly good supper, too, cooked by Mr President Yaqoub himself. So, of course, the Holy Father has resisted the clamour to rewrite the Good Friday prayer for the Jews according to a racist agenda; those who believe that the Jews alone among all the races of the world should be excluded as a matter of principle from the saving grace and mercy of our Lord Jesus Christ will find little comfort in the prayer he has composed. If omnes homines are called to recognise Christ as Saviour, it would be preposterous if that privilege were denied to His own race. And, happily, the Pontiff has introduced a reference to S Paul's teaching in Romans that, as the fulness of the Gentiles is gathered in, so that people also, to whom God promised that his Covenant would not fail, will turn back to Him. From an Anglican perspective, perhaps two points can be made. The Anglican equivalent of the 'Tridentine' Rite is the the Prayer Book of 1662, which is still the normative rite of the Church of England, especially in the doctrinal sense. It has been amended since 1662 (one recent change is the removal of the ban on ordaining ordinands who don't know Latin), but its Good Friday prayer, summarising the last three of the old Orationes sollemnes, has been left unchanged. It runs: O merciful God, who hast made all men, and hatest nothing that thou hast made, and willest not the death of a sinner, but rather that he should be converted and live: have mercy upon all Jews, Turks, Infidels, and Hereticks, and take away from them all ignorance, hardness of heart, and contempt of thy word; and so fetch them home, blessed Lord, to thy flock, that they may be saved among the remnant of the true Israelites, and be made one fold under one shepherd ... I wonder why those who made such a kerfuffle about the 'antisemitic' nature of the Tridentine Rite have never turned their catterwauling attention to the Anglican Rite. What a shame it is that Anglicanism is now not even held in enough regard to be unfairly attacked. My other point is a trifle more literary. The ancient Solemn Prayers were, as the great Anglican student of the classical Romamn Rite G G Willis pointed out, composed with careful attention to cursus: the system whereby the final words of clauses bore rhythms, derived from pagan Roman rhetoric, designed to make their public declamation sonorous and elegant (Willis used this discovery to date the prayers). In the 'Benedictine' prayer, the first clause-end has the rhythm veritatis veniant - which is not a recognised clausula. The final clause, salvus fiat, is also irregular; unless one 'scans' it Israel salvus fiat ... hurrying over the word salvus ... which would allow us a respectable velox. I am unsure what dogmatic conclusion to draw from this.